Ultima Thule is not the object humanity thought that it was last month. When the robotic New Horizons spacecraft zoomed past the distant asteroid Ultima Thule (officially 2014 MU69) in early January, early images showed two circular lobes that when most simply extrapolated to 3D were thought to be, roughly, spheres. However, analyses of newly beamed-back images -- including many taken soon after closest approach -- shows eclipsed stars re-appearing sooner than expected. The only explanation possible is that this 30-km long Kuiper belt object has a different 3D shape than believed only a few weeks ago. Specifically, as shown in the featured illustration, it now appears that the larger lobe -- Ultima -- is more similar to a fluffy pancake than a sphere, while the smaller lobe -- Thule -- resembles a dented walnut. The remaining uncertainty in the outlines are shown by the dashed blue lines. 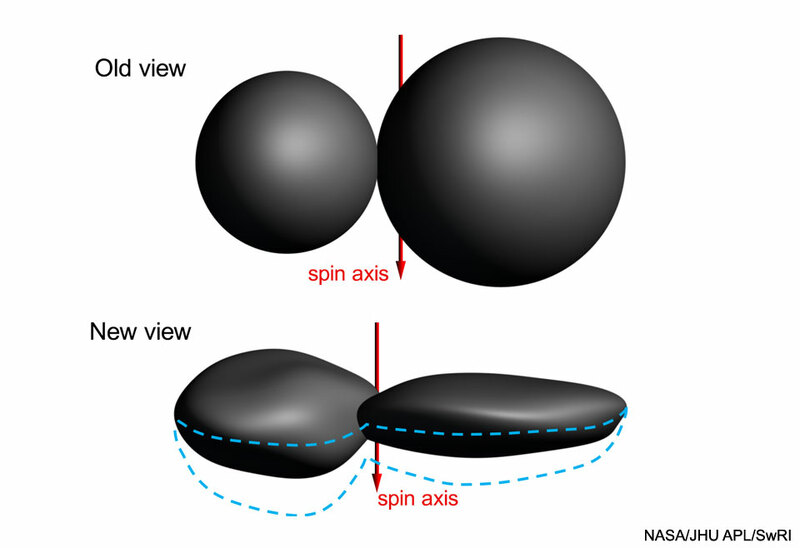 The new shape information indicates that gravity -- which contracts more massive bodies into spheres -- played perhaps less of a role in contouring the lobes of Ultima Thule than previously thought. The New Horizons spacecraft continued on to Ultima Thule after passing Pluto in mid-2015. New data and images are still being received.